Upon entering the property, you are greeted with a spacious entrance hall with stone tiled flooring and access to the cloakroom, kitchen/breakfast room and living room. The kitchen is located to the front of the property and is fitted with an attractive range of wall and base units topped with work surfaces and inset sink finished with tiled splash backs. Integral units include dishwasher, washing machine, 50/50 fridge/freezer, double oven and a gas hob with cooker hood over. Located to the rear of the property is a spacious living room with French doors leading out into the conservatory and an under stairs cupboard. The conservatory is generously sized with doors leading out onto the garden and a wall mounted heater to allow all year round use. 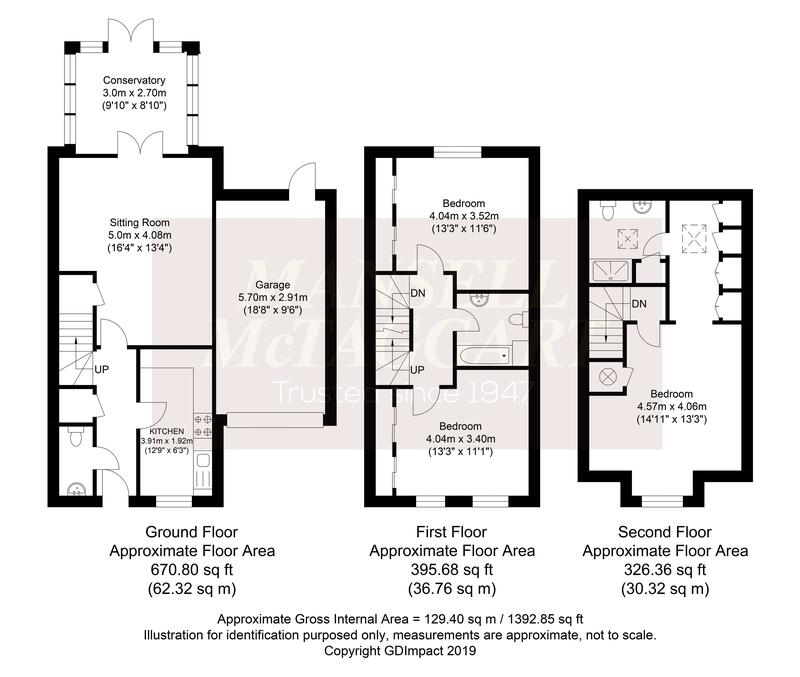 Off the first floor landing are 2 double bedrooms both benefiting from fitted wardrobes and a family bathroom fitted with a modern white suite comprising of a bath with mixer taps and shower attachment, WC and wash hand basin finished with part tiled walls. The spacious master bedroom is located on the second floor and boasts its own dressing area and en-suite shower room fitted with a WC, wash hand basin and shower cubicle with part tiled walls. Located midway between London and Brighton, the town of Horley lies south of the twin towns of Reigate and Redhill and north of Gatwick Airport and Crawley. The mainline station provides a regular train service to London and the South Coast. There is easy access to the M23 and A23 and the town is also linked to Redhill, Gatwick and Crawley via the Fastway bus service. A shopping centre, post office, library, variety of restaurants, leisure centre and recreation grounds can all be found within the local area. Nursery, primary and secondary schools are located across the town.